The Disney Channel has a new original movie premiering this year called Girl vs. Monster. 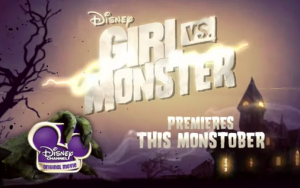 Girl vs. Monster will first air on Friday, October 12, 2012 at 8:00pm ET during the annual Monstober programming event on the Disney Channel. An encore showing will be aired Saturday, October 20, 2012 on Disney XD. On Friday, October 5, 2012, the cast of “Girl Vs. Monster” will host Disney Channel’s “Monstober Night of Premieres” featuring frighteningly fun Halloween programming, and a sneak peek of of the new movie. The adventure begins as Skylar, a fearless teenager with a powerful singing voice, prepares for the ultimate Halloween bash with her best friends, Henry and Sadie. However, the plan for Skylar to sing at the party – with rock band cutie Ryan Dean – is crushed when her parents make her stay home. When she attempts to sneak out of the house, she accidentally unleashes a monster – Deimata – who is determined to change the fate of Skylar and her family forever. As Skylar’s world is turned upside down, she learns that her parents have been keeping a big secret – that she comes from a long line of monster hunters. Now, it’s up to Skylar and her friends to channel their inner strength and conquer more than just this monster. The cast includes Kerris Dorsey (“Moneyball”), Brendan Meyer (Disney XD’s “Mr. Young”), Luke Benward (“Minutemen”), Katherine McNamara (“New Year’s Eve”), Adam Chambers (“Good Luck Charlie”), Tracy Dawson (“Call Me Fitz”), Brian Palermo (Disney XD’s “Zeke and Luther”) and Jennifer Aspen (“GCB”).